Oaxis might be best know for the InkCase Plus, a universal E-ink smartphone case, but this company is also working on custom case solutions as well. News just crossed my desk of the InkCase i6, a new case for the iPhone 6 which adds a 4.3" E-ink screen to Apple's smaller smartphone. 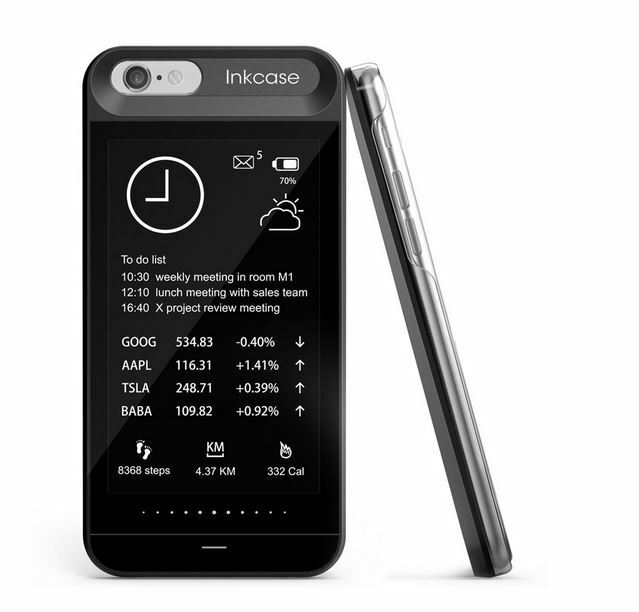 The InkCase i6 was first shown off at CES 2015 in January, but I only just heard about it today. The i6 builds on Oaxis' early disappointing cases for the Galaxy Note 2 and for the iPhone 5. The i6 sports a sleeker, iPhone 6 inspired design which avoids the blocky and chunky look which inspired one reviewer to say "Oh god no, those look so hideous and bulky". The case has its own battery, and pairs with the iPhone over Bluetooth. The 4.3" epaper display on the i6 has a screen resolution of 800 x 480, and is intended to be used as a secondary screen. You can push photos to it, or use it as an ereader, or - well, there's really not much that you can do with it. Oaxis is pretty good at improving their hardware, but the software features are still as disappointing as on the review unit I tested in November 2011. As I pointed out when I reviewed the InkCase Plus in December 2014, you can't actually do all that much with the InkCase due to the software limitations. The InkCase i6 for the iPhone 6 is scheduled to launch in May, while a case for the iPhone 6 Plus won’t arrive until the second half of 2015 at the earliest. But I would not recommend getting one, not until we know that you can actually do something with it. Instead, I would watch and wait for the reviews of the PopSlate. That iPhone case may be running two years late but it is expected to launch in late March 2015. PopSlate's new PR rep swore up and down that it would knock my socks off. I don't really believe that, but it is enough to keep me watching for the reviews.